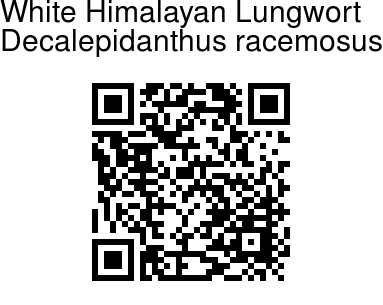 White Himalayan Lungwort is a spreading or rising perennial herb with white flowers, in contrast to the blue flowers in other closely related species. Flowers are white, about 1 cm across, in clusters at branch ends. They have blunt spreading petals and 5 short scales in the throat, typical of the Forget-Me-Not family flowers. It is a softly hairy, weak plant, with stalked leaves. Leaves are heart-shaped to elliptic, 2-3 cm long. Stems are leafy, 8-15 cm long. Nutlets are smooth, brown black. 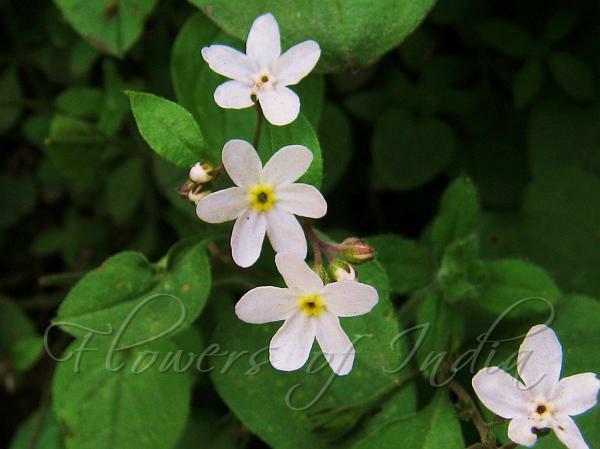 White Himalayan Lungwort is found in forests, damp rocks, common in the Devdar forests around Shimla, at altitudes of 1800-3000 m. Flowering: March-May. Identification credit: Krishan Lal Photographed in Lajwa, Sirmaur, Himachal Pradesh.